Quads near Olsen's Landing on Powell Lake. We love riding quads to explore Powell River's backcountry. Forest service and logging roads are open to the public after 6:00 pm on weekdays, and on weekends or holidays unless otherwise posted. Theodosia and Olsen Valley are connecting watersheds that run from the ocean at Theodosia Inlet to Powell Lake. Over the last century, logging activities have left mains, spurs, and trails that give access to points of interest and historical treasures. You reach Theodosia Main via Highway 101, Southview Road, Theodosia Forest Service Road, a logging spur, and a connecting trail. Beyond the head of the inlet, a turnoff to the left leads to an old homestead quad riders call Rupert's Farm. 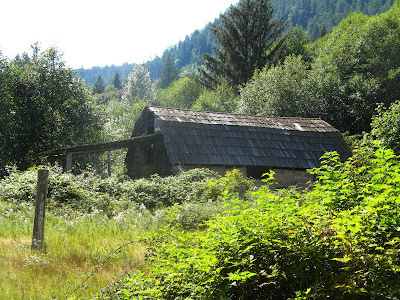 A few old buildings, a barn, pastures, and rusting vehicles remain to explore. An old barn at Rupert's Farm near Theodosia Inlet. Near Olsen Lake, Theodosia Main heads up into the hills. 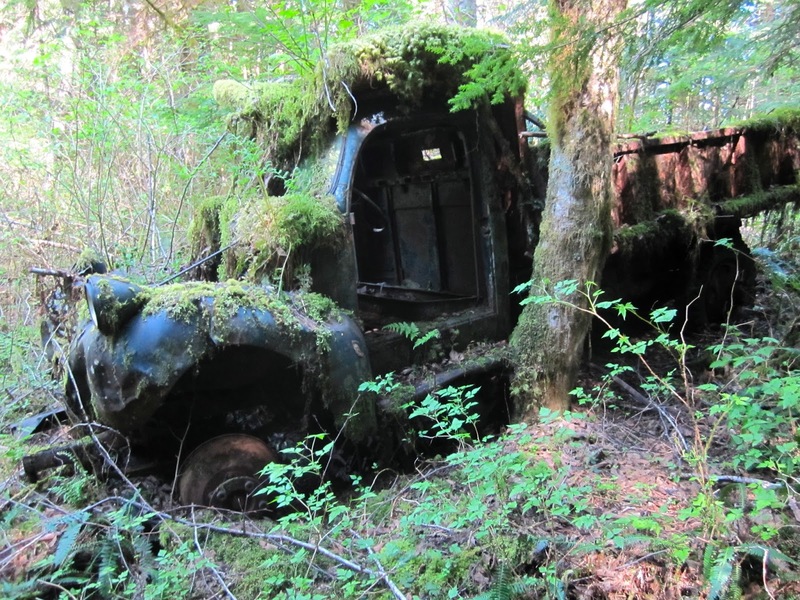 There we found an abandoned logging truck. Abandoned logging truck on upper Theodosia Main. Olsen Lake makes a good lunch stop with spectacular views. From here, Olsen Main takes over heading down the valley towards Powell Lake. Past Olsen Lake, a spur to the right heads to a cabin used by one of the settlers who homesteaded in the Olsen Valley. Remains of a settler's cabin in the Olsen Valley. Continuing on Olsen Main, another logging spur to the right takes you to the foundation of an elaborate homestead along the Olsen River. Foundation of another homestead in Olsen Valley. The next treasure is on a deactivated logging road between Theodosia and the Powell Lake logging dock called Chippewa North. Just beyond a slash at the Theodosia end there's a collection of old vehicles. Old vehicles on deactivated logging road near Theodosia Main. The last stop is Olsen's Landing on Powell Lake. The logging dock is still in use, but you can see from all the growth on it's massive cedar logs that it's a part of history too. 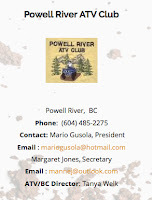 If you want to know more about exploring the Powell River backcountry, contact the Powell River ATV Club on Facebook, or by phone or email. Help from locals may be needed for you to find some of these off-road treasures. Looks like you had a lot of fun. These places look really interesting. Good luck on your further adventures! 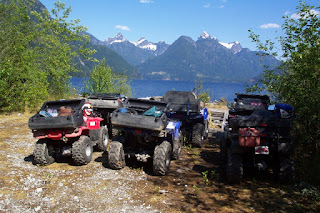 The Powell River Quad Rides. 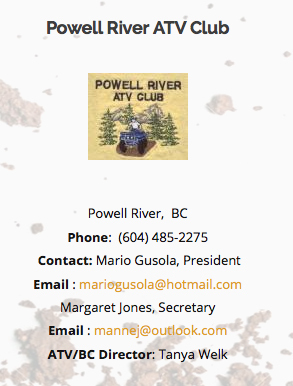 blog brings together and updates all of the ATV posts from the Powell River Books Blog into one easy to use site. We hope it will inspire our readers to get out and enjoy the backcountry, and encourage visitors to come see all that Powell River has to offer. All books are also available in other eBook formats. Check Smashwords or your favourite online vendor.